Europe’s unemployment has soared to 10.8 percent, the highest rate in more than 14 years as companies from Spain to Italy eliminated jobs to weather the region’s crisis, according to the European Union’s (EU) statistics office. That’s the highest since June 1997, before the Euro was introduced. European companies are cutting costs and eliminating jobs after draconian austerity measures slashed consumer demand and pushed economies from Greece to Ireland into recession. The North-South divide is evident, with the nations reporting the lowest unemployment rates being Austria with 4.2 percent; the Netherlands at 4.9 percent; Luxembourg at 5.2 percent; and Germany at 5.7 percent. Unemployment is highest among young people, with 20 percent of those under 25 looking for work in the Eurozone, primarily in the southern nations. The European Commission, the EU’s executive arm, defended the debt-fighting strategy, insisting that reforms undertaken by governments are crucial and will ultimately bear fruit. “We must combat the crisis in all its fronts,” Amadeu Altafaj, the commission’s economic affairs spokesman, said, stressing that growth policies are part of the strategy. According to Markit, a financing information company, Germany and France, the Eurozone’s two powerhouse economies, saw manufacturing activity levels deteriorate. France fared the worst with activity at a 33-month low of 46.7 on a scale where anything below 50 indicates a contracting economy. Only Austria and Ireland saw their output increase. Spain, whose government recently announced new austerity measures, had the Eurozone’s highest unemployment rate at 23.6 percent; youth unemployment — those under 25 years of age — was 50.5 percent. Greece, Portugal and Ireland — the three countries that have received bailouts — had unemployment rates of 21 percent, 15 percent and 14.7 percent respectively. Germany’s unemployment declined more than predicted in December as car and machinery exports boomed and one of the mildest winters on record helped construction jobs. The number of jobless people declined a seasonally adjusted 22,000 to 2.89 million, according to the Nuremberg-based Federal Labor Agency. Economists had forecast a decline of 10,000. The adjusted jobless rate fell to just 6.8 percent. German firms are working virtually nonstop to fulfill orders for exports and investment goods. As a result, the nation has defied a debt crisis that the European Commission fears will unleash a recession throughout the Eurozone. The Munich-based IFO Institute’s measure of business confidence also rose unexpectedly in December. Polls show that the majority of Germans see their jobs as secure even as Europe’s biggest economy slows. Forward-looking indicators including IFO’s underscore that the German jobs motor is fundamentally intact, said Johannes Mayr, a senior economist at Bayerische Landesbank in Munich. Except for an unexpected 6,000 increase in October, German unemployment has declined in every month since June 2009. The average jobless total in unadjusted terms for 2011 was well below the three million mark, Labor Agency head Frank-Juergen Weise said. “German unemployment mastered the dual impact of the debt crisis and weakening economic growth in 2011 but these risks remain, accompanying us as we enter the new year, Weise said. Both the jobless total and the jobless rate were at their lowest level since unification in 1991, noted German Economy Minister Philipp Roesler. “2011 can be described as the most successful since German unification for working people,” Roesler said. “Demand for labor remains very high, despite the current economic risks. Overall, the upturn in employment should continue, albeit at a slower rate. The labor market remains one of the main pillars of our economy,” the minister said. The national statistics office Destatis reported that the number of employed people in Germany hit a new record of 41.04 million in 2011, with more than 500,000 jobs created. It was the first time the number of people working in Germany has risen above 41 million, Destatis said. The nation’s population is approximately 82 million. “Overall, labor market conditions will remain markedly healthier in Germany than in most other countries in Europe in the months ahead,” said IHS Global Insight’s Timo Klein. At present, Germany is confronting a shortage of skilled labor. Leading economists anticipate that Germany’s economic growth will slow in 2012, in line with other major Eurozone economies, which may put a squeeze on wages and jobs. But, unemployment at a record low for the last 20 years, is a position that most countries envy and a sign of the way Germany has rebuilt itself since the Wall was torn down. This is one reason why companies are not shedding significant staff, even if the economy hits a downturn, said Berenberg Bank’s Holger Schmieding. Germany’s labor market strength means that domestic demand will “remain a pillar of support” to the eurozone “under very challenging circumstances otherwise,” Schmieding said. The Eurozone badly needs this help. For example, Spain again published dire labor market data with the jobless rate rising by nearly 2,000 in December when compared with November. Eurostat’s most recent data showed October unemployment in Spain at 22.8 percent, by far the Eurozone’s highest. Spain represents an entirely different scenario. During 2011, unemployment in Spain soared 7.9 percent, totaling an astonishing 322,286 individuals. Nearly one-third of all the Eurozone’s unemployed are Spanish; approximately 50 percent of young Spaniards are out of work. The tough austerity measures outlined by the new prime minister, Mariano Rajoy, are likely to push Spain’s jobless rate even higher. These include €8.9 billion in spending cuts and tax increases to cut Spain’s borrowing which should total €16.5 billion in 2012. Spain closed out 2011 with a deficit of 8 percent of its GDP, significantly higher than the six percent reported at the end of 2010. “This is the beginning of the beginning,” said Deputy Prime Minister Saenz de Santamaria, noting that Spain is facing “an extraordinary, unexpected situation, which will force us to take extraordinary and unexpected measures.” She stressed that the wealthiest will be increasingly taxed for at least two years, resulting in expected budgetary gains of €6 billion. 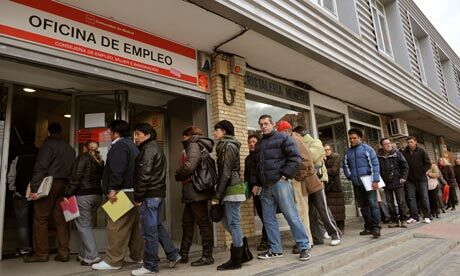 These numbers represent a new 15-year high in Spain’s unemployment rate “The figures for the number of registered unemployed for the month of December confirm the deterioration of the economic situation during the second half of the year,” according to Spain’s labor ministry. Once the Eurozone’s job creation engine, Spain has struggled to find jobs for the millions thrown out of work since the 2008 property bubble collapse. The bad news fueled fears that Spain, the Eurozone’s fourth-largest economy, was slipping back into recession after the economy posted zero growth in the 3rd quarter of 2011. Prime Minister Rajoy’s new government has promised to fight unemployment and fix the country’s finances as its top priorities. Rajoy plans to present a major labor market reform which will alter hiring laws and Spain’s collective bargaining system to encourage companies to hire workers. Spain’s secretary of state for employment, Engracia Hidalgo, said the successive labor reforms carried out by the previous government “never made the labor market more dynamic and flexible.” Spain lets the jobless receive unemployment benefits for a maximum of two years. Prime Minister Rajoy’s government extended a monthly payment of 400 euros ($520) for people whose benefits have run out. Otherwise, the payments would have expired in February.